I am in Mexico for nine days, giving myself more space to write and my daughter more space to learn Spanish. It is going well. Yesterday, after my daughter’s Spanish lesson, I shared with her tutor, Genio, the work that I do as an author, health consultant, and colon cleanse guru. His shining black eyes lit up, even brighter than usual. “My friend, who I sit with in the sauna one time each week at the Jardin de Botanica, suggested that I use the enema, about one each week, to bring myself to excellent health. He told me just last week. He tells me that he uses the enema, one a week, along with his sauna. He is very healthy, 65, the most energy-filled man I know," Genio said enthusiastically. “That sounds like a great idea,” I said. “Yes, I have not been feeling my best. 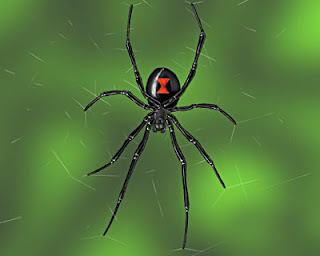 Three years ago, a black widow spider bit me. I had worked a 16-hour day, doing political work. When I arrived home, I was very tired that I lie in my bed, on top of my covers, without taking any of my clothes off. In the night, I felt a pain in my leg, around my ankle. I thought that my clothes were bothering me, so I took them off and got under the covers. When I next awoke, it was very bright out. I was supposed to be back to work early at 7:30. I was worried that I was late. It seemed like the sun was too high in the sky. As I arose, I lifted the covers and looked down to my leg. I lie back down, thinking that I must be having a nightmare, as my leg around my ankle was the size of a melon. I then had a deep peace come over me. Yes, I was in a nightmare. I went back to sleep. I woke up two more times, looking at my leg, seeing the sun high in the sky, feeling a deep peace, knowing I was in a nightmare, going back to sleep. I was not worried,” he recounted. “Wow. How long did this go on?” I asked. I was all ears, bathing in the splendor of Genio's story. “They took me to the hospital. The doctor told me that I was a very lucky man to still be alive. That I had not moved had kept the poison mostly in my leg. However, now I have problems with my stomach that I didn’t have before the spider bit me: each time I drink milk or eat cheese, I have an upset stomach. My friend told me that if I use the enema one time each week, I will return to excellent health.” Genio looked at me hopefully. “That is an excellent idea,” I offered, considering that over time, we could also explore auto-immunity and his other options to improve his health.